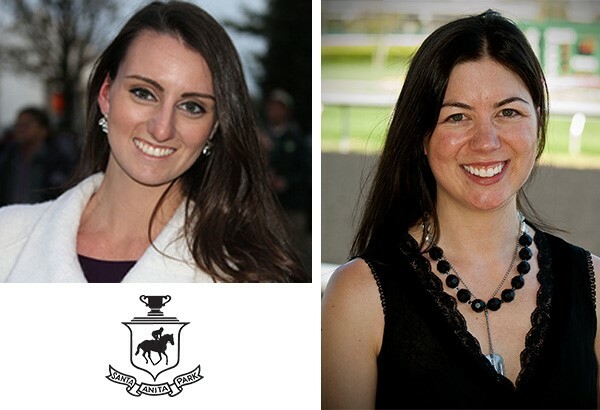 ARCADIA, Calif. (Sept. 22, 2016)–Santa Anita Park has announced that Angela Hermann and Megan Devine will work as a broadcast team analyzing races and interviewing horsemen trackside and from the paddock throughout Santa Anita’s upcoming Autumn Meet which opens Friday, Sept. 30. The talented pair will be seen before and after races on Santa Anita’s simulcast signal which is streamed live at santaanita.com and at calracing.com. They will also be readily available to groups and individual players as The Great Race Place continues to reach out to a new generation of fans. A Minnesota native, Hermann was a longtime paddock analyst at Canterbury Park and just finished a groundbreaking stint as track announcer and racing analyst at Golden Gate Fields this past Sunday. Introduced to the sport as a fan through her late father, Hermann brings an enthusiastic perspective to each “equine puzzle” that she addresses. A native of Rockville Centre, New York (Long Island), Devine, who is also an accomplished rider, attended the races as a youngster at Belmont Park and Saratoga prior to attending the University of Louisville, where she captained the school’s Intercollegiate Horse Show Association Team. While at the University of Louisville, Devine began working as a production assistant for NBC leading into the 2012 Kentucky Derby and has since traveled with the network, working on Triple Crown and Breeders’ Cup shows in various capacities, including Assistant Field Producer and Stage Manager. This past summer, Devine, who won the title of Miss University of Louisville in 2014, was allowed to combine her extensive riding experience and handicapping expertise in becoming the first-ever simulcast racing analyst at Ellis Park in Kentucky. Beginning with opening day’s Grade III Eddie D. Stakes, Hermann and Devine will have an abundance of world class racing to analyze and promote. Following the track’s opener, Santa Anita will then present five Grade I Breeders’ Cup Challenge “Win and You’re In” prep races on Saturday, Oct. 1 as horsemen prepare for the two-day Breeders’ Cup World Championships at Santa Anita on Nov. 4 & 5. For more information on Santa Anita’s 23-day Autumn Meet or the Breeders’ Cup at Santa Anita, please visit santaanita.com, or call (626) 574-RACE.